The launch of the company’s Whiteboard public preview for Surface devices is a ‘step in the right direction’ for a more modern and natural style of collaboration, analyst says. Microsoft is bringing its Whiteboard ‘digital canvas’ app to Windows 10 users, providing a new way for employees to collaborate on creative work and share ideas. Whiteboard, aimed at Surface owners, makes use of the device’s stylus and touch inputs to share drawings. Users can jot down notes, make precise illustrations or search for images on the web from the app. It can also create tables, diagrams and flowcharts, which are updated in real time and automatically saved to the cloud. 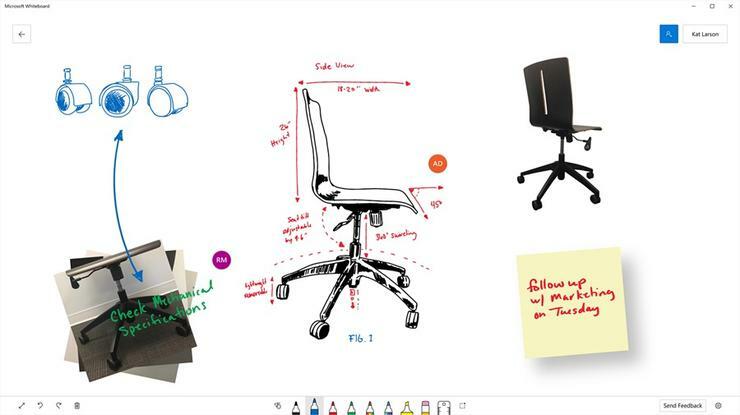 “It’s designed for teams that need to ideate, iterate, and work together both in person and remotely, and across multiple devices,” the Microsoft Whiteboard team wrote in a blog post. “This is certainly a step in the right direction for a more modern and natural style of collaboration,” said Alan Lepofsky, vice president and principal analyst at Constellation Research. Whiteboard is specifically tied to Windows 10, “thus limiting its cross-platform appeal,” he said. “Still, I am pleased to see that Microsoft is so highly focused on improving the way people create and share information. The preview has been available for a few months as a private beta, where it was used by customers for a variety of purposes such as real-time product design collaboration with clients. The public preview can be downloaded here. The app is free for individual use, but requires an Office 365 subscription for multiple users. The plan is for Whiteboard to also replace a similar app that currently runs on Microsoft’s SurfaceHub digital whiteboard. Richard Edwards, distinguished analyst at Freeform Dynamics, said that launching Whiteboard on Windows 10 gives Microsoft a number of opportunities: “It gives Surface owners a chance to show off the capabilities of their devices, it gives Whiteboard users a glimpse of what Microsoft Hub can bring to meetings [and] it brings the PC back into the meeting room, offering an alternative to Apple and Google devices,” he said. While he sees Whiteboard as promising, it will be important to see which partners are able to create integrations for the app.